As a former software engineer and CEO, I used to hold the “engineer-centric” view that sales is not a critical function in an organization. I believed that product excellence and market fit obviated the need for a formal sales function: Build a great product, and customers will come. That view was short-sighted, to say the least. The technology companies that are able to both build great products and integrate a strong sales function are the ones that succeed, whether consumer or enterprise — from Microsoft to Salesforce and yes, even Apple and Facebook. You may not hear about it, but all the world-class companies have a strong sales force. Still, I’m often asked the question of “Why sales?” by entrepreneurs and technical founders. The “why sales” question becomes even more pressing given the trend towards “bottoms-up” product adoption — i.e., getting the user (including developers as buyers) to use a given product by offering it for free or without a formal top-down sales motion, as is common with SaaS. So why not simply invest in hiring more engineers and let the targeted end-user virally adopt the product of their choice? The answer is that an unstructured, bottoms-up, user-generated sales motion does not unlock the full value of a given product. If you build it, they may come… but they probably won’t discover — or use — every feature you want them to. Most users view it only through the lens of their own use case, not through the personas of all the users in an enterprise (which is a view someone at the top, like a CIO, is more likely to have). For example, a security or audit feature that is critical to a CIO might be completely irrelevant to an individual user. A formal sales function promotes the value of a product to an organization in ways that individual adoption and usage can’t. They demonstrate the importance of features across the board, including criteria-setting, pricing, and packaging that lets you unlock more of the value you’re materially creating for that organization with your product. The result is greater penetration into the enterprise, higher product appreciation, and more revenue from a given customer. 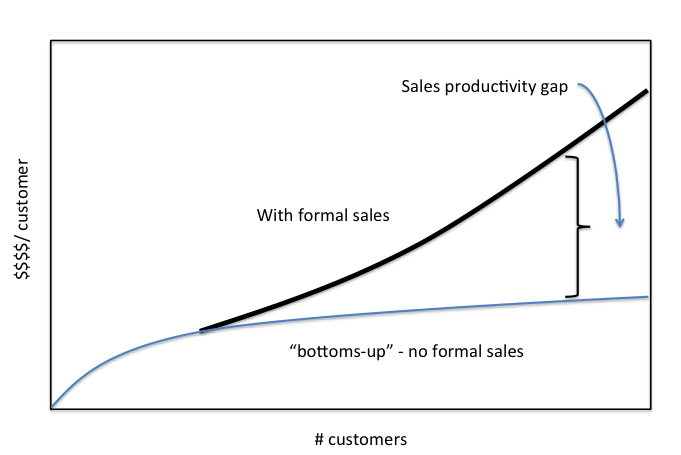 That’s why combining a tops-down and bottoms-up approach by layering a formal sales function yields the best results. While it might seem that a sales organization is too expensive, the revenue added can far exceed the cost (you want your sales organization to generate 3x its loaded cost). Creating a formal sales organization will help accelerate revenue and product adoption, as well as result in more satisfied customers. Yet sales is deceptively complex, in ways that are often unappreciated. Details such as hiring, forecasting, account management, and go-to-market strategy are tasks that require deep expertise and prior experience. So how to hire a head of sales? Day 1: I’m going to run sales because it’s not very complicated and I can learn this stuff an a few months. After all, I created our product, raised venture capital, and sold our first big deals. I know how to sell. Day 30: This sales stuff is coming along great. I just read a book on sales management, and now understand that a top-of-the-funnel pipeline is important to quantify. We’re going to implement some way of developing a pipeline. Day 90: We now have a pipeline, but I’m not sure how to exactly create qualified leads or a methodology of prioritizing what opportunities will close when. I talked with a friend of mine who has a certain scoring system. Also not sure whether to use salesforce.com or excel to manage all of this. Day 180: Read another book on hiring sales people. But all the sales people I meet seem terrific; they all met their quotas at their previous companies and attained President’s Club (hey, do we need one of these too?). Not sure which one to hire, plus they have such different backgrounds. We seem to have a pipeline built, but only four of the thirty deals we had forecasted for the quarter closed. I need to do a better job on our pipeline analytics. In fact, this past weekend I wrote a machine-learning algorithm to help us better understand our sales leads and pipeline. I’m going to ask that our sales org use this on a regular basis. Day 270: This sure is taking a lot of time. I hired three reps, but only one of them is working out. If I fire two of them, I start back at zero. I think I need to spend more time with the individual reps and teach them everything I know about the product. That will make them way more efficient. I’m having a sales deep-dive offsite next week to go through the sales process and technical material. The moral of this (very familiar) story? Hire a proper head of sales! (By proper I mean someone you can trust to run the function on their own, not just a junior proxy with you as de facto lead.) The right sales lead will intuitively understand how to build out a sales team and process without your getting into the weeds and diverting your precious time into an unknown arena. Ask what you can do to help your sales VP: Can I help with closing a deal, visiting a customer, or rallying the troops? Managing a head of sales isn’t easy, but whatever you do, don’t micro-manage. Let your head of sales do the heavy lifting, but understand the high-level levers and sales economics too. Your job is to make sure sales becomes a seamless part of your company’s success. Finally, don’t forget that your job as CEO is to also help close deals as necessary — you should be doing this at least a few times a month. Remember, your first head of sales will likely not be the last. Hiring the right person at the right time with the right background is critical for success, and in a startup, an early head of sales is likely to be a hands-on contributor who also has the capability to manage a handful of people. These “renaissance” VPs also understand how to deal with the ambiguities of an early startup. But as your company grows and the sales organization becomes larger and more transactional, that early hire may not have the interest or skill set to scale with the operation. Also, scale only when you know a model works. It is very tempting to scale sales far ahead of demand. But this often results in a bloated and expensive sales force that’s not able to sell much product. The consequence is cash burn, disenfranchised sales people, and unhappy customers. Build sales only when you see demand. It’s better to be a bit late than overbuild too early. Finally, sales has the power to — and surely will — change your company’s culture, and many CEOs (and startup employees) talk about the negative cultural changes as a result of building out a sales force. This does not have to be the case, but you need to take responsibility for guiding the alignment of these functions in your company. Left to their own devices without this guidance, engineering and sales have a high chance of blowing each other up. A CEO needs to be very involved in the process of getting these two important pillars of your organization to integrate well with each other. This is not to say that your culture won’t change. Every new function changes your culture — the question is whether it is a positive or negative change. CEOs who embrace sales as a positive and important influence on the company, understanding the full potential that sales can unlock, will achieve the best results.